It’s getting to be that time of the year when most of us start to think about all the things we’d like to change about ourselves, our bodies and/or our families and our lives at the new year. Most people think of it as setting new year’s resolutions or goals if they just had enough will power, but I think we all know how that goes. Most of us start the holiday season with high hopes it will feel different this year. We’ll have the heart-connected family we’ve always dreamed of, our house will be magically transformed by Pinterest-worthy decorations and we’ll glide into the new year celebrating with lots of champagne and none of the heartache or hangovers most of us suffer with. Let’s face it, most holidays fail to live up to expectations. We eat our feelings or try to drink the discomfort away, we shop too much, we live in obligation and expectation and basically ruin the last six weeks of every year and then set ourselves up to fail again at the new year. Starting in the new year, I’ll…. Run a marathon (after never having run a mile before in my life). Lose a ton of weight (right after I eat all my emotions over the holidays). Fill in the blank on whatever your perceived shortcomings are here…. I’m here to invite us all to stop the resolution madness. Resolutions don’t work and they leave us feeling worse in the long run, so let’s just quit before we start, shall we? Instead let’s focus on how we want next year to FEEL. And this time we get to pick how we want to feel. Would it be nice to set up your life around the way you’d like to feel? When I think in terms of feelings, rather than ‘goals’ or resolutions, I come up with a completely different list. Some possible feelings I am trying on for the new year: connected, cozy, compassionate – to self and others, nourished, nurtured, loved, abundant, rested, well taken care of, healthy, enough. You get the picture. Nothing in that list even hints at what could be wrong with me, it is instead simply a wish for a better feeling life experience. So rather than punish myself with exercise as a way to pay for emotionally eating or god forbid, not wearing a size six, I will focus my energy on creating experiences that cultivate my chosen feeling. For example, last year I chose CONNECTION as my word of the year. The previous year I became a stay at home mom and found myself feeling super lonely and I wanted that to change. Each activity I chose in 2013 came back to this word: connection. Would staying home in my yoga pants (again) help me feel more connected than getting out to the park and chit chatting to other stay at home moms? Would staying in town versus maybe running into terrible traffic be better than making a breakfast date with lifelong friends in the Bay Area. You get the idea. I weighed my status quo against how I wanted to feel and made the effort to connect with friends and family. I am not the first to suggest this idea of framing an experience as feeling: Rosie did it really well and even gives you a tutorial. Danielle did it too. The whole point is this: you already have everything you need. 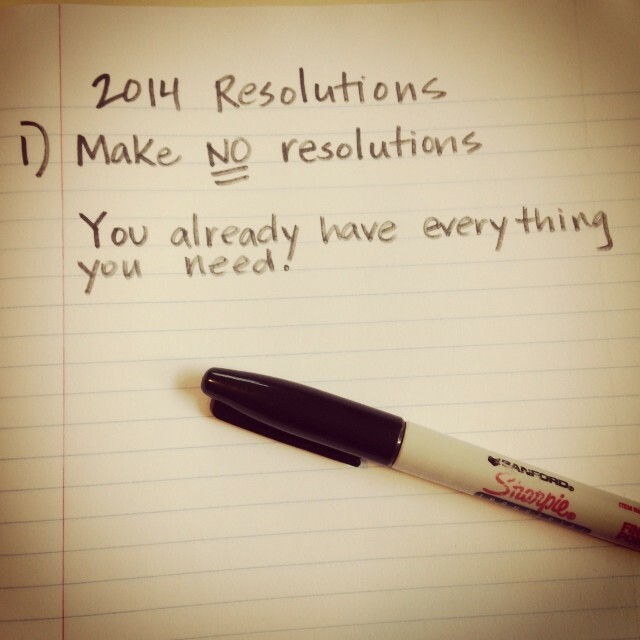 Consider this post to be your invitation to have a better new year – one without resolution. If this sounds like an idea you can get behind and you’d like to join in there are two ways. Join me on New Year’s Day for Restoration NOT Resolutions: a restorative yoga and guided writing workshop. We will spend the afternoon together deeply relaxing and rejuvenating with a long restorative yoga session before we diving into creating an intentional feeling for next year using a guided writing exercise. I am bringing hot stones and dairy free cookies and tea for extra warmth and comfort. If you live outside Northern California, you can join in from home by resolving to give up resolutions, do an at home yoga retreat and do some writing on your own. Either way, I wish you a wonderful new year filled with the feelings you wish to cultivate in 2014. This entry was posted in A Yoga Story, Self-Care, Tiny Tips Tuesday and tagged It's All Yoga, no New Year's resolutions, Restoration NOT Resolutions, restorative yoga, Sacramento, Sacramento yoga, writing workshop by Teacher Goes Back to School. Bookmark the permalink.